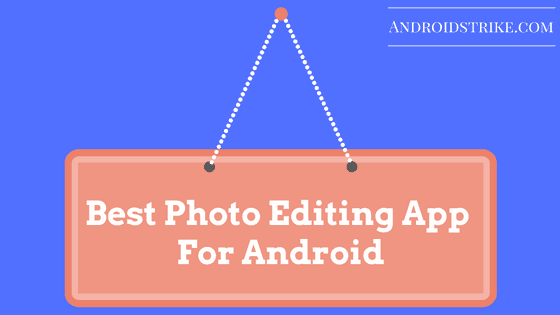 Best Photo Editing Apps For Android: Photography is one of the usually used feature in smartphones in the present term. Interestingly, Android has taken a significant role in Photo editing and massive growth in Photograph industry. In these days, People snapping photos with their smartphones and sharing with Friends and social media sites like Instagram, Whatsapp, and Facebook. Now, You can make your photo even more stylish and eye-catching by adding Filters, Frames, and some effects. Picture Editing and enhancing from the smartphone has never been so easy. But, these apps will spin your Photo editing into fun. Just with a few changes, you can change your picture by adding themes and adjustment with instant social sharing. Snapseed is the most Popular Photo editing app for Android comes with the average rating of 4.6. The free version app supports both the platform (Android and iOS) and good looking User Interface. The app has plenty of features proudly Developed by Google. Crop your photo, tune it and add more color adjustments, enhance with shadow. Share it with your friends. No need for the brief explanation for Instagram. The app lets you share your photos and videos and just more than Photo Editing app. You can add effects to different collaboration and the ability to share your photos within social media accounts for more likes and comments. PicsArt is one of my favorite Photo editing apps. With this app, you can make lots of fun and even make your events special with collage maker feature. This picture studio comes with the inbuilt camera to edit your photos at the time. More than that it has photo effects like overlays, frames and text effect, etc. The app has pretty good advantages and makes sure that you have installed on your smartphone. Once upon a time, Aviary photo editing app has more downloads. It is the powerful Photo editor which lets you create and edit images in the easy and optimized way. This app also has the same features as PicsArt and different in the, UI. Easy slide sharing, Photo effects, collage maker and cosmetic tools like red-eye removal, blushes remover are some of its features. The free app from Adobe. As we all know, Adobe Photoshop is the most useful and awesome editing tool for Photos and Videos. In the Android version, Adobe Published Photoshop as Photoshop Express with the hassle-free feature to turn your editing on the smartphone when you’re not having the facility of the Desktop. This app comes with Auto fix options, one touch filtering, and On-screen editing. This will create your photo even more professional. Even share your photos with Social media accounts…!! These are the apps which are tested on my Android smartphone to do the review in a better way. You too try by installing the rated apps. Which also Available now in Google Play Store, Links are Given Above. I hope you enjoyed this topic about Top photo editing apps. I am using PicsArt and PhotoShop Express on my smartphone. If you’re giving a try. Please let me know which app you’re using right now in the comment section.